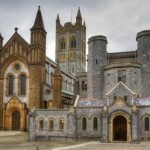 Buckfast Abbey is home to a community of Benedictine monks which was first established in 1018. In addition to impressive architecture and pleasant gardens, you will find an award winning gift shop stocked with a wide range of unusual products including the famous Buckfast Tonic Wine. Castle Drogo was built for Julius Drewe, the founder of “Home and Colonial” which became one of the largest retail chains in the UK. It took 19 years to construct and was completed in 1930, making it the last castle to be built in England. 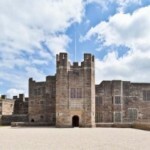 The National Trust have undertaken significant conservation work to save Castle Drogo which gives a fantastic opportunity to witness the restoration work whilst exploring the Castle and enjoying the beautiful gardens. Family owned zoo set in 33 acres of woodland that inspired the Hollywood film “we bought a zoo” starring Matt Damon and Scarlett Johansson. A great way to visit Dartmouth – catch the steam train from Paignton to Kingswear and travel across the river Dart on a small ferry. Also operates the last coal fired paddle steamer in the UK used for pleasure trips along the river Dart. This tree-top adventure includes two 235m zip wires. In 1577, Sir Francis Drake set sail in the Golden Hind from Plymouth and travelled around the world, the first Englishman to do so. In truth, he had been commissioned by Elizabeth I to plunder the Spanish colonies of South America. 3 years later he returned with enough treasure to please a Queen – she knighted him shortly after, on board the Golden Hind. 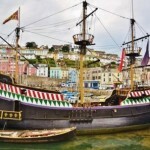 A Full sized replica of the Golden Hind, the most iconic Tudor ship, is situated in the picturesque harbour of Brixham. It’s easy to make a day of it at Brixham, why not stay for a spot of “crabbing” and an ice cream too…..
A working glass and games factory which is worthy of a visit, if only to see the amazing marble runs and the giant floating marble! 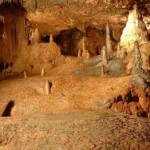 Prehistoric cave with an extensive labyrinth of spectacular and easily accessible caverns. Incredible stalactites and stalagmites! The oldest human fossil found in Britain was found at Kents Cavern. Living Coasts is a coastal zoo and aquarium where you can see a wide range of seabirds and marine life from around the world. The penguins are our favourite. 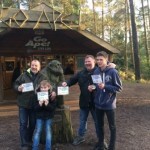 Another great day out, especially for younger family members. 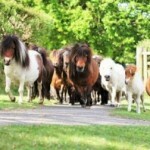 Activities include Animal Feeding, Pony Grooming, Pony Rides, Tractor Times, Meet the Pets and Pony Bedtime. Please note that this attraction is only open from April to October. 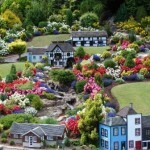 Four acres of gardens showcasing hundreds of model scenes, vehicles and people. 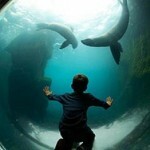 A big zoo with virtually everything. A fantastic day out for all the family with so many different activities such as Piggy Cuddles, Egg Collecting, Goat Milking, Falconry and much much more. Check their website for opening times as normally closed in winter months. 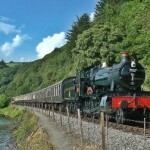 Steam railway running along the stunning valley of the River Dart between Buckfastleigh and Totnes. 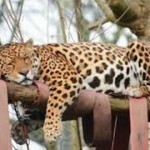 Why not also visit the Totnes Rare Breeds Farm, Dartmoor Otters and Buckfast Butterflies on the way. 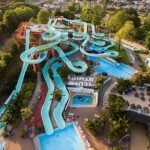 Splashdown Quaywest Waterpark boasts the UK’s most exciting water slides (8 of them!) mixed with some of the best English Riviera views. The Waterpark is next to Goodrington Sands, a great beach day out for the whole family. A great day out for the whole family. 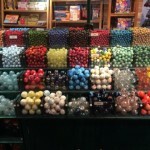 Trago Mills is a retail attraction which offers unbelievably good prices on thousands of items from clothing, sporting equipment including fishing and shooting, tools, household items – the lot. In addition it has a great fun park for the kids, everything from boating rides, go-karting, miniature steam train etc.